Home / Modern Pest Blog / What are Termite Swarmers? The first signs of termite season are swarmers. 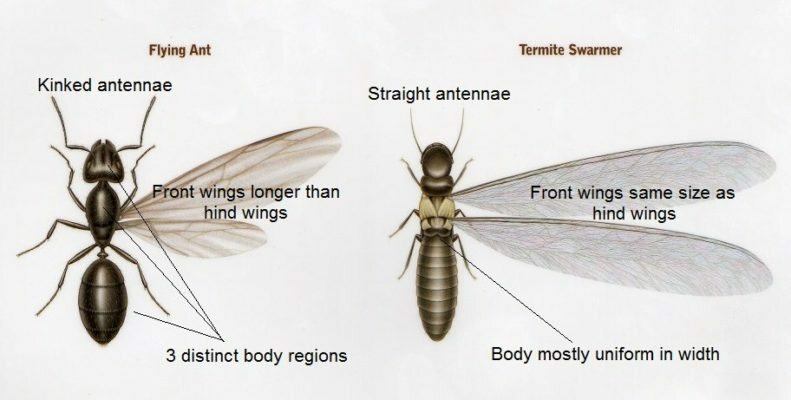 Swarmers are winged young adult male and female termites that have left to start a new colony. Swarmers are also called reproductives. Termites can cause $5 billion in damage annually, and it’s usually not covered by insurance. Keep reading to find out more about swarmers, and how Modern’s Homecare Termite Control Service can protect your home from termite damage. When temperatures reach 70 degrees, swarmers begin to emerge in large groups. Females emit pheromones that attract males. Once a male locates a female, they symbolize being a couple by breaking off their wings. They will then select a nest location, mate, and become the king and queen of a new colony. It can take another three or four years for this new colony to mature and produce swarmers of its own. Termite queens can live for over 30 years. Modern Pest now offers financing options for termite services through GreenSky. Click here to apply now! Termites have a broad waist. Flying ants have a narrow waist. Flying ants have bent antennae. Termites have front and rear wings of equal size. Flying ants have bigger front wings than rear wings. Termites are referred to as “silent destroyers” because of how they stealthily enter homes. They can compromise a building’s structural stability in only three months. That’s why it’s important to protect your home with regular inspections from Modern Pest. If we find evidence of termites, then Modern’s Homecare Termite Control Service is the next step. Have you seen flying swarmers? Discarded wings? Damaged wood? You might have termites! Call Modern for an inspection today at 1-888-997-3312. What can you expect from Modern Pest Services when we visit your home? INSPECTION – An in-home termite inspection noting current termite activity, visible damage, and conditions conducive to future activity. INSTALLATION – Professional installation of the Sentricon Termite Colony Elimination System, using Recruit® termite bait inserted into strategically placed in-ground bait stations around your home. MONITORING – Continuous monitoring for new or increased termite activity. MAINTENANCE – Regular maintenance of the always active Sentricon System. If you think you have an issue with termites, call Modern today for an inspection at 1-888-997-3312.